"What is "normal?" That's the question an eager young scientist, narrating her very first book, hopes to answer. Unfortunately, her exceedingly "normal" subject—an orangutan named Norman—turns out to be exceptionally strange. He speaks English, sleeps in a bed, loves his stuffed toy, goes bananas over pizza, and even deep-sea dives! Oh, no: what's a "normal" scientist to do? 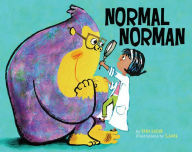 A humorous look at the wackiness that makes us all special— and a gentle reminder that "normal" can't ever be defined!" As a high school teacher, I don't have the opportunity to read very many children's books to my students. When I can, we are all excited for the chance to step inside a world of imagination that neither of us have visited since we were children. Normal Norman is one of those rare children's books that I can teach to my high school students while also being one that is appropriate for children. The narrator begins by telling us that this is her first book. In it, she is going to define "normal". As a teacher of teenagers who struggle with this idea every day, I can say that defining normal isn't easy for them or for the narrator. She investigates the definition and finds that Normal isn't Normal. Growing frustrated, the narrator begins to question her assignment and worries that she will fail. She cannot define normal. But can any of us? With expressive illustrations that depict both the narrator's frustration and Norman's endearing qualities, this book is one that will stay on my bookshelf at school, there for my students to pick up when they think they can get away with reading a children's book during SSR, only to realize that the moral of the story ("being abnormal is normal") applies to them as well. I can also see myself employing this book as a resource for a "definition" essay. That being said, there are endless applications of the universal theme of identity. Keep following Norman's blog tour by checking out the dates below!